Being the only women to show at the Chelsea Film Festival this year would put pressure on anyone, but Naghmeh Shirkhan doesn’t let it bother her. 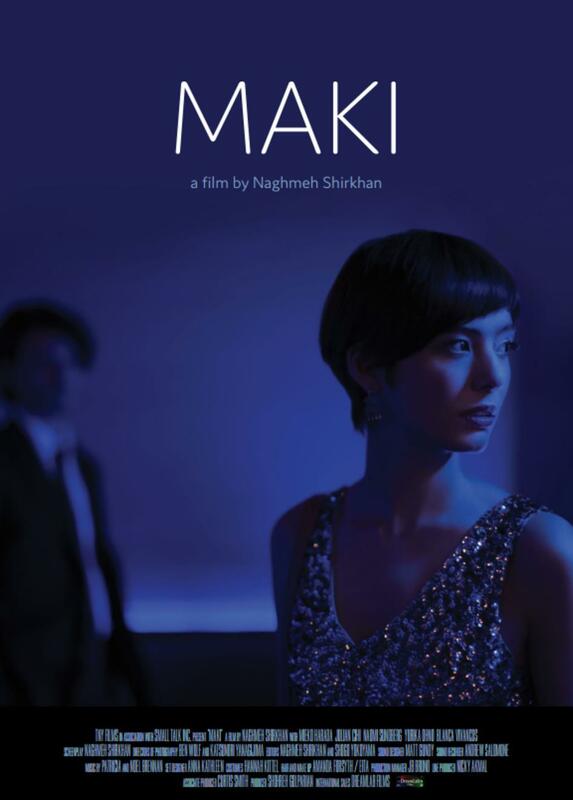 The director of ‘The Neighbor” and “Maki” has won multiple awards at film festivals spanning from Los Angeles to Milan, but in between flights she had a chance to talk with ARTRPRNR MGZN about everything she’s accomplished. Thinking back, was there any specific moment in your childhood that lead you to become a filmmaker? There were many moments in my childhood that inspired me to pursue filmmaking. I left Iran at the age of 5, but I remember much of my childhood and the images were embedded into my memory. Perhaps because I felt I had to leave the place and people I deeply loved. Maybe it’s this strong visual connection to a childhood interrupted that compels me to want to work in a visual medium. Of course, I haven’t had an opportunity to recreate any of that, and probably never will since I now live in the west and don’t have much occasion to go back to Iran. But I have a lot of interesting memories growing up in America too. Life as an Iranian ex-pat living with a young single mother in America is full of interesting moments. Boston University is a great school, how did you end up there? I grew up in Boston, a university town, and my mother, who I was living with at the time, actually banned me from applying to schools outside of Boston. I wasn’t very rebellious at the time and I listened to her. But BU was great because it had the prestigious College of Communication which offered a degree in broadcasting and film. Since I knew I wanted to learn more about filmmaking, it ended up being the best fit. I spent a semester at USC but realized Los Angeles wasn’t ready for me, so I went back to Boston and finished my studies there and came to New York to pursue independent filmmaking. I felt like I finally found my tribe there. In your experience, how do films that come from a person’s experience differ from those that are fiction? Even though I draw from my own experiences, I’m still more interested in telling my stories through fiction. I think you can get to a deeper truth if you’re not bound to documenting your story. That kind of filmmaking doesn’t really interest me. I want to recreate the past in a more heightened, filmic way. How did you come up with the inspiration for Maki? I wanted to tell the story of a young woman who is being used by people she trusts. It’s an age-old story but told in a fresh way. The setting of the hostess club and the Japanese cast also made the telling of this story that much more appealing to me. It was an opportunity for me to learn more about a culture I had always been fascinated by. I think I was Japanese in one of my past lives. I feel very at home there. Some people experience creative blocks after doing projects, how do you keep your creativity alive? I spend a lot of time alone, the solitude is what I need to be able to write. There are many ideas that I’d like to explore but first I need time to sketch them out and see which path they end up moving into. What other filmmakers do you look to for inspiration? I love the French New Wave and anything made by Godard, Rivette, Varda, Truffaut. But I’ve also studied Italian Neo-Realist filmmakers like Rosellini, De Sica, as well as Fellini and Antonioni. Then there are the Japanese films by Kurasawa, Mizoguchi, and Ozu, and Iranian modern films of Kiarostami, Bani Etemad and Amir Naderi have also deeply inspired me. You’re the only female film director at the Chelsea Film Festival. How does it feel to represent women in this way? It was a huge honor, but it made me realize how much more difficult it is for women to get their films made and shown. I loved showing at CFF. The programmers and judges really appreciated Maki. What has the response been like from ‘The Neighbor’ and how do you think that will compare to the response you will receive from ‘Maki’? The response for The Neighbor was amazing. So many people from all backgrounds related to the story of Shirin and Leila. And critically it was a huge success as well. Nothing like it had been done before. The response for Maki has been even more enthusiastic and encouraging. It was a huge risk, telling a Japanese story set in New York City. But I felt compelled to see it through despite the many obstacles. I’m more confident in my filmmaking as a result. I feel like a was able to figure out the most insane puzzle and the audience’s love for the film has been the most gratifying gift. How do you think your work has grown from your first film ‘The Neighbor’ to your newest one ‘Maki’? The Neighbor feels like a documentary because of the way we shot it and the amount of time we had to make it. It was a luxury to spend three and a half months in Vancouver with my cast and crew. The work became our life and our lives became the work. Making Maki was a long process from start to finish but we had only 18 days to shoot the whole story which spans a seven month period. I wanted to make a more stylized film in the vein of Kobayashi and Kurasawa. I framed every shot and choreographed every scene with far more precision. This time I had much less time, so I had to be far better prepared going into the shoot. Also, I spent two years working on the post for Maki. Whatever we didn’t have time to do during the shoot, I had to somehow compensate for in post-shoot. What’s next for you and your films? My films will continue their life in some capacity online. Hopefully, they’ll be resurrected on the big screen as time passes and audiences and programmers find their way back to them. I’ll probably take a break and try to fill the well. I want to continue making films but I won’t compromise quality for quantity so I’ll take my time with my next project as well.